Getting back to Spain from England had its aggravations. We opted to fly rather than take the ferry and trains as originally planned, though never before had we flown the bikes between European destinations. Bill's usually elaborate process of packing the bikes in carefully selected, free, bike-shop boxes gave way to buying expensive zippered bike bags. After phone calls to bike shops in 3 cities and a special order, we finally obtained the second of the 2 bike bags 24 hours before our flight. Bill made peace with the less secure packaging to increase our odds of squeezing the bikes into taxis to and from the airports in Bristol and in Spain, though his packing efforts were supplemented with a cardboard bike box, 25 cable ties, and a length of dense insulating foam for water pipes. Unexpectedly, our Bristol hotel was adamant about not letting us stash the bikes in their luggage room or any other secure place--it was their open-air, city-center parking lot or nothing. At that point we had 1 of the 2 bike bags so Bill spent a couple of hours breaking down both bikes on the curbside as I shuttled the bikes into our room in pieces. By the time we checked out, we'd have 2 bags and the bikes would exit as luggage not bikes, so we thought it worth the subterfuge. Our decision to bend the rules a bit was validated the next morning we when learned that a woman had interrupted bike thieves in the process of stripping her bike that had been parked in the vicinity of our hotel that very night. She had secured her bike with 3 locks while seeing a movie but the lads were helping themselves to everything unprotected by the lock, right down to the brake pads. Fortunately our packed bikes just fit in the back of the taxi, though we were charged double the normal rate for the ride. At the Bristol airport EasyJet hit us with a hefty $100 over-the-weight-limit fee though a British cyclist had commented that they never were charged for being overweight with their bikes. We then had unpleasant run-in with airport security about what we could carry-on and what we couldn't. I am thoroughly in agreement with their intent, but the contradictions in the policies are too, too absurd. Like, why can you take electrical cords on board but not a cable lock; string is not allowed but shoe laces are OK; and of course being able to bring cigarette lighters in the cabin is totally bizarre. But hey, we finally made it through the process. Our plane was an hour late in leaving but all of our luggage arrived in Spain, including the little packet of items that didn't make it past the carry-on clearance and had to be checked separately at the last minute. The Spanish cabbie was sure the bikes wouldn't fit in the back of his mini van but thanks to the more compact bike bags, they just slipped in. And the bikes survived the flight just fine, though we always consider that their fate is more determined by the mood at the moment of the baggage handlers than Bill's fine packaging efforts. Torremolinos and the nearby Malaga were a bit of a disappointment. We went thinking we had found a home-away-from-home but now we are hoping to do better. Its enticing credentials included: an airport used by one of the budget airlines in Europe; train service (not a given for Spanish cities); a fleet of moderately priced hotels and short-let apartments; a bunch of language schools; and a reputation for year-round sunny weather. We had hoped it would be a place we could light for a few weeks at a time to study Spanish and take day rides into the hills while basking in pleasant weather. But day rides are out as it takes hours of grinding through urban traffic to get anywhere and bikes aren't allowed on the 2 train lines servicing the area, which prevents riding the rails past the traffic. Much of Torremolinos, where the tourist lodging abounds, is a sorry place. Franco encouraged the development of tourist facilities to pep up the local economy 30 or 40 years ago, but it wasn't done with class. It's a cramped, concrete jungle built on the beach without the gracious promenades and green spaces of more modern designs. Much of it is a long strip of old hotels fronted by T-shirt shops. And it attracts a phenomenally sedentary crowd and lacks the energy infused when tourist areas are integrated into the adjacent community. Torremolinos was however quite the melting pot of European cultures. More French, German and Dutch was heard on the sidewalks than Spanish and the Dutch especially seemed to have a grip on the commerce. Many restaurants featured Dutch names and when surfing at an internet shop and I selected English over Spanish, the Google screen defaulted to searching in Dutch--yikes! 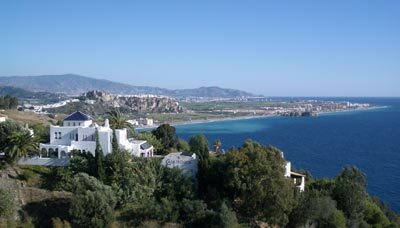 A view east of Malaga. After 4 nights in Torremolinos, we headed out on the freshly reassembled bikes. Instead of lining up Spanish lessons at a language school, we settled for buying a teach-yourself Spanish kit with a couple of CD's, a small booklet, and some flash cards. And the next time we have economical surfing available, we'll check the Spanish railway website for rail lines open to bikes in a town served by a budget airlines somewhere else on the southern Spanish coast. Despite the disappointments at Torremolinos, we loved being back in Spain. The first week we paid $39-57 for our rooms--averaging less than half of what we paid in Britain. And of course the weather couldn't help but be nicer this far south. The first few days ranged from the low 60's to the high 70's with some days bright and sunny, others overcast with a cold wind but at least we were out of our long johns. We will miss the ease of speaking to people and of understanding the news every night, though at one place we were treated to both BBC World Service and CNN's overseas programming and loved the immersion in international news. And as expected, the transition back to riding on the right-hand side of the road was all but instantaneous, even after 4 months of doing it the other way. Our brains seemed to know all along that we would come to our senses and it was a relief to have a lifetime of reflexes be reliable once again. It didn't take long in Spain to be reminded of both the good and the bad about the Mediterranean way of life. Those 3 hour shop closures in the afternoons aggravate us, as well as the tourist sites that close for the day at 1:30 or 2 pm. The clattery and echoing noises due to the tile and marble floors in the hotels can disturb our peace, as does the lack of prohibition against smoking in the rooms and halls, and the occasional reveler returning at 3 or 4 am. The dozens of stray dogs we see some days break our hearts, as do the piles of trash strewn in the countryside. And the lack of spoken English and the highly intermittent English news leave us feeling a little isolated. But of course there are the things we come for, like the blue skies, dry air, and rich history. The mushy, sweet persimmons are heavenly treats and the wide shoulders on the road put an ease into our riding day and take the pressure off of route planning. The lower prices and friendly people make it inviting to tarry and Spanish is accessible enough for us to enjoy learning a few new phrases each day. After a few days of touring we were once again intoxicated by the deep pleasure of rural riding with a warm sun on our backs. There is nothing more delicious than pedaling for a couple of hours under a bright blue sky and then indulging in a leisurely picnic lunch. We found ourselves lingering on the pavers of a 4-house community's tiny plaza, part in the shade and part in the sun to get the temperature just right. Reminiscing about the past, fantasizing about the future and savoring the moment seemed like the most important things we could be doing. It's as relaxing as slipping into a hot bath or as giddy-making as too much alcohol but without the side effects. The afternoon's ride didn't disturb the deep sense of well being that the mix of the exertion and lounging had delivered. The pleasure of the day reminded us again at how few of these sweet days we'd had this touring season. Unremitting cold, wet weather and even a few snow flurries had dominated the year and we spent most lunches bundled in heavy clothes and rain gear, contracting our bodies against the elements instead of relaxing into the warmth as we were now doing. What a delight to have found our bliss on the road again. Identifying trees in western Britain was definitely one of those unplanned, unexpected joys of the year, though our British tree books of all common European trees were woefully inadequate in southern Spain. We all but gave up looking for the giant-leaved, Mediterranean foliage in our guides. We'd become masters at spotting seed vehicles like tidy little hazelnuts tucked neatly away behind their leaves and here huge, sword-like seed pods dangled carelessly before us. As we moved away from the complex urban plantings of massive leaves, amazing pods, and stunning blooms, we did find a few species we had spotted in England. White poplar, ash, and willows appeared along stream banks and pines became more numerous at the higher elevations. And one of our British specimen plants, the Indian Bean Tree, even turned up as row plantings along one city's streets. We did ID an evergreen oak with a holly-like leaf, a Holm oak and an Aleppo pine, but almost all of our comparisons with our books resulted in "It's sort of like....." instead of "Here it is!" We resigned ourselves to turning our eyes that had become keen at spotting tree details into being fascinated by Spanish words. Spanish, not botany, now would be our roadside entertainment. After some pre-work, we all but mastered numbers in one afternoon by reading aloud every number we saw on the road and on passing license plates--something I had expected we'd spend weeks working on. We learned that leisurely pedaling makes an almost ideal learning laboratory as the road riding keeps the mind alert and yet hungry and receptive to new information. Our teacher-yourself Spanish kit was perfect for me as it stripped the verb conjugations down to the 4 most used forms from the proper and always taught 6 forms (a third less fuss). Our Rick Steves' phrase book continued to embolden us in speaking in full sentences and we became more daring in asking for help from the linguistic experts around us. We each strove to obtain pronunciation tutoring with one word a day from hotel staff and retail clerks to make up for the lack of a formal teacher. The time we had spent in England looking at trees was now spent reading aloud signs on store fronts and on package labels as our Spanish proficiency sped along. Some days found us more exhausted from the effort expended on our Spanish studies than from cycling. Granada was the first stop on our southern Spain history tour with the Moorish palace complex the "Alhambra" being the focal point. 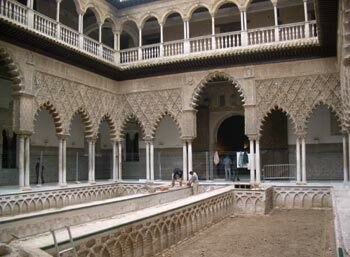 The Moors, primarily from Morocco, occupied most or part of Spain from the late 700's until the late 1400's, with Alhambra being their last stronghold in the country. Staring at the intricacy of their remaining plaster and wood artwork transports one to a different time and place. The fine detail in the massive architectural pieces speaks to their artistic skill as well as their religious devotion. It was also chilling to be in these once hallowed Andalusian spaces and realize that they are on bin Laden's list of lands to be reclaimed by Muslims. Granada didn't dazzle us with its charms like Barcelona in the east last winter, but it does still exude its jumbled, turbulent past. The narrow, pebble-clad streets that snake up the steep hillsides of the Muslim old town set it aside from the noisy, modern city scene a few blocks away. And the past collisions between the Phoenicians and the Romans and then Christians and the Muslims are now played out in a much smaller scale between the pickpockets and Roma's and the rest of us on the sidewalks. Our guide book warned us of unstoppable Roma shoe shiners and aggressive Roma women who shove sprigs of rosemary into the hands of passersby and then uncompromisingly demand a handsome payment. Our footwear wardrobe of only sandals would deflect the shoe shiners, so we only had to ward off the rosemary hustlers. I rehearsed 2 repelling Spanish phrases on our way into town and we cinched up our security measures to discourage pickpockets before we headed out onto the streets. It seemed to be off season for the Roma's too as we didn't find them difficult. I did however wonder if some street-wise urban American hadn't slugged a Roma when one touched too much while forcing rosemary into their hand as they never touched us but were virtually groping some Spaniards with their efforts. Once they were convinced we were off-limits we were able to stand back and watch their nervy routine with amazement. And we braced ourselves as we then moved to the next old town location notorious for its scams and theft. We were pleased to see Granada's sights and leave without feeling accosted or having left any 'donations' behind. A crossroad's fountain around an old olive press. As we rode west to Cordoba from Granada we passed through the relatively isolated province of Jaen (ha-en') where the olive tree is king. We were surrounded by olive groves for days as we rode. As far as we could see in any direction, the hillsides were blanketed by neat rows of olive trees. Some of the hills (and us) rose up over a 1000' and the trees were always there. 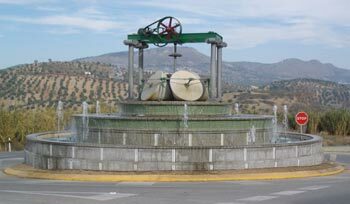 A town's fountain featured an old stone olive press and the junk yards weren't filled with cars but of out-of-service olive presses, oil tanks and other processing hardware. As we rode by silo-like tanks of olive oil we wished there was a roadside spigot for topping-off our 1/2 liter bottle. I read that Jaen province alone has over 40 million olive trees that cover about 1/3 of its land and that it produces about 10% of the world's supply of olive oil. Traveling in late November put us just at the beginning of harvest season. Almost all of the trees had a mix of ripe, black fruits; maturing olives the color of purple grapes; and immature, green olives. One day we sat respectfully on the edge of a grove to each our lunch and enjoyed the presence of these robust trees. They looked like they flourish here more than the trees we saw in Italy and Croatia and were all heavily loaded with branches and olives. And on the warmest days we savored the distant smell of the olives themselves on some of the back roads. We wondered if some of these Andalucian olive trees were as ancient as they looked as olive trees can live to be 1,000 or 2,000 years old. Those with enormous trunks had all been severely pruned so that relatively scrawny little branches sprung unnaturally out of massive bases. A few very spindly young trees were occasionally intermingled with the grand-daddy' of the old groves. Almost all of the groves were manicured as the chalky white to mustard yellow soil was literally swept free of organic debris with circular patterns around the trees still evident in the powdery dirt. And young and old, the trees were all about the same height--presumably pruned for harvesting efficiency. Business must be booming as they are actively converting more fields to olive groves. And the fields didn't stop at Jaen's province line though became mixed with cotton, grapes, and onions as we neared Cordoba. Olive trees are clearly king in Jaen, but orange trees were rarely out of sight in Andalusia. Orange trees appeared in private courtyards, along public walkways and in massive groves. The sometimes shrub-like trees with branches often touching the ground were all laden with fruit. Many plump oranges were going to waste and we wondered what the ethics were about plucking fruits from trees in public spaces--we never helped ourselves but were sorely tempted. Cordoba's Mezquita across the street. We'd been 'buying up' a bit in our lodging for about a week in Spain hoping to have a more appealing abode for not much more money but with little success. We kept ending up with windows that looked onto a wall a foot or 10' away--the kind where you can't even see the sky from your room. We tried again in Cordoba and advanced our focal distance to about 20' but what a wall we were looking at this time. The view out our windows was completely filled by the detailed facade carvings on a 1000 year mosque, the Mezquita (meth-key'-tah). 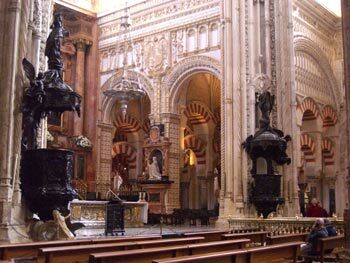 My glaze is always drifting outwards when I am indoors and the Mezquita was a feast for my ever-hungry eyes. I scrutinized the deep plasterwork carvings by the harsh light of sunrise; admired the splashes of terracota-colored brick work in the afternoon shadows that were echoed in our full length drapes; and was captivated by the magical transformation made by the nighttime illumination. Our wooden window shutters were open until the moment we went to bed and were reopened within minutes upon arising so as to savor every possible moment of this eye-level extravaganza. We couldn't believe our luck in getting this hotel room. The 40% low-season reduction put the room at 44€, about 7€ above the youth hostel price for non-youths. It was the bright, fresh, tastefully done room in an historic building that we had hoped for over the last couple of weeks, plus it had a sliver of a balcony and this to-die-for view. 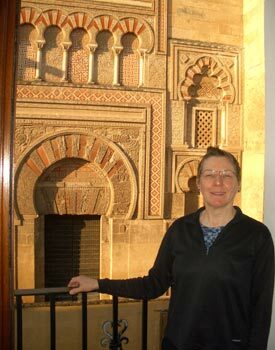 Our Hotel Mezquita continued the 'good to be alive' feeling for days that Cordoba had given us in the first few hours. Like Granada, Cordoba sports a single major tourist sight and that sight is an architectural gem built by the Moors during their occupation of Spain. But unlike Granada, Cordoba has an inviting, cohesive feel about it. In Granada, the Alhambra palace grounds sit high on a hill, intentionally isolated from the old town. And Granada's old town is very separate from the modern community. In contrast Cordoba's focal point, the Mezquita, is situated in the heart of the old city and the new city transitions seamlessly from both. We strolled around Cordoba, effortlessly moving between food shopping, sightseeing and lingering in the winter sun. 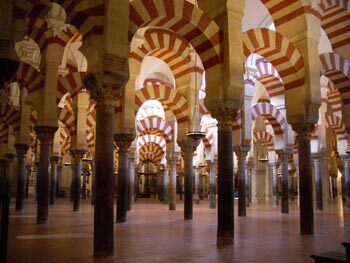 The classic shot of Cordoba's Mezquita. The Mezquita was on my short list of 'must see' sights in Europe and I was delighted to have a pleasant build-up to this anticipated experience. Indeed, the endless rows of columns supporting red and white striped, two-tiered arches was as visually delightful as in the picture books and postcards I'd seen over the years. The columns and arches created a mesmerizing, tranquil space that was pleasantly proportioned for a single visitor while being able to contain 40,000 people at one time. But I was only there a few minutes and I found myself sympathizing with bin Laden's desire to return Andalucia to the Moslems--the Christian church and chapels tastelessly plopped down within it denigrated the artistry of this wonderful building. 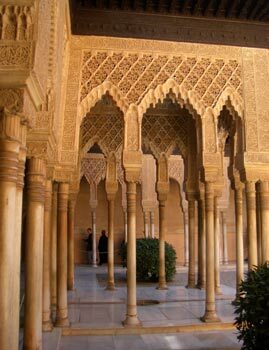 Almost all of this Moorish-era architecture was of strong, simple lines that were repeated so as to draw one into the space. It created a sense of peace and yet encouraged exploring the varied looks produced by the repeating patterns. The over-the-top decorativeness of the gilded Christian icons looked so tacky, so out of place. It was like dropping a drive-through McDonald's down on an ancient Greek hillside village. Revolted by the sight of the desecration of such serenity, I recoiled and retreated to an unspoiled area to recover in the calming repetition of the undisturbed sections of arches before resuming my tour. Still offended by the visual travesty before me, the audio guide information did softened my harsh views a bit. Yes, the Christian's had trashed the place, but at least they hadn't leveled it and in addition, some of the Mezquita's beauty had come at the expense of others. Almost all of the more than 1,000 columns used to support the Mosque's splendid, simple arches were 'recycled' from Roman buildings and Visigoth churches. The decorative church superimposed on the Mezquita. Few hands are clean in the history of countries and religions, and so was the case here. The Moors had taken from churches to build their monument and no doubt the Christian's before them had helped themselves to the treasures of the vanquished to build their churches. This mosque converted to a church was a vivid physical reminder of the ongoing, vicious wars over who is following the 'right' god. It was like an architectural representation of the recent pair of CNN-Europe specials that juxtaposed the dueling between two socially regressive forces: US evangelical movement shaping our government and the Islamic fundamentalism that is financed by Saudi Arabia. It underscored that though this is a very distressing time in our history it is also a fascinating time to be immersed in other cultures. The next stop on our history tour was Seville to the west. Like Cordoba, we rode into Seville along the Guadalquivir River and immediately felt at ease in our old town abode. The charm of Seville's old, narrow streets juxtaposed against the lush promenading parkways made our heads briefly turn towards the "Apartment for Rent" signs. We stumbled across Seville's 16th century cathedral, one of the largest in the world, during our first minutes in the old town. The curls and swirls in its Gothic decor reminded us more of Gaudi's organic 20th century details than the more rigid Gothic style so popular in more northern parts of Europe. With effort, we were able to identify the remains of the Islamic minaret that now supports the cathedral's bells--all that remains of the former mosque. An inner courtyard in Seville's Alcazar. As in the other Andalusian cities, the Moorish architectural monuments are the big draws and in Seville it was the 11th century Alcazar, or fortress-palace that was "the place" to see. It oozed with the stunning plasterwork and wood carvings that we have come to expect and we enjoyed being in yet another big expanse of it rather than just seeing scraps of ruins. Here as in Granada, we were awed by the commitment to massive garden areas which didn't just provide relief from the scorching summer sun but were also designed to tantalize the senses with the sounds of trickling water and the sweet scent of orange blossoms. And we were again reminded that the charming, decorative aspects of Moorish architecture were crafted into buildings for centuries after the Moors lost political control, even into the 20th century, as "Mudejar" style (Moorish art under Christian rule). We rounded-out our Seville cultural experience with an incredibly brief "now you see it, now you don't" tour of the bull fighting ring and a trip to the archeology museum. The best part of the bull ring tour was that it prompted a follow-up visit to our encyclopedia where we learned that bull fighting is a growing industry in Spain that employs more than 1% of the workforce. The archeology museum added to our just opened chapter on the Tartessos culture which evolved with the arrival of Phoenician traders around the 9th century bce. The Phoenician's generated a lot of pizzazz in the southern Iberian peninsula by bringing iron, stunning gold working techniques, the potter's wheel, an alphabet and new crops with them. The locals had had some respectable artisans of their own, but the Phoenicians catapulted them into the hyped-up world of the eastern Mediterranean technology of the time. 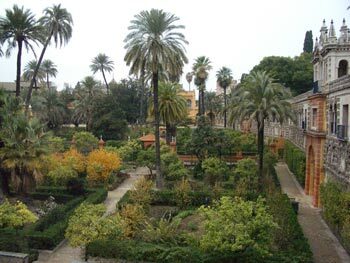 The modern gardens at Seville's Alcazar. With less than 2 months left before we fly back to Portland for reconnecting, re-supplying, and restoring ourselves, our thoughts also drift to the months behind us. This hasn't been the most memorable touring year, though we didn't expect it to be as dazzling as prior years. This was a catch-up year: a year to see the places we thought we'd visit our first year and didn't. We knew that visiting the Western European countries just couldn't deliver the impact of the culturally far-less familiar Eastern Europe and even more exotic Turkey. The reduced culture and language shock made it easier traveling though overall less interesting, as expected. But fortunately, this year lacked the unwelcome excitement of close-encounters with wolf-killing Turkish dogs and of riding on a wobbly bike that I couldn't readily bring to a stop on a hill in the rain. Though those events made for vivid memories and exciting reading, it was just as well to have had a year with less of that kind of excitement. Though it's been a touring season with fewer big "wow's," it has had its share of memories. Riding the western and northern coasts of Spain gave us a closer look at that rustic lifestyle as it merges with the modern world, plus put a face on the political struggle of the Basque. The painted and decorated caves of northern Spain and southern France were a wonderful pre-historical immersion, as were the standing stones of western France and southern England. Visiting Normandy checked a "must-see" off of Bill's list, as did seeing the less well-known Ironbridge in England. We enjoyed reconnecting with new friends in southern England and visiting with former Portland friends traveling through Edinburgh. And riding through the gales in western Scotland and visiting Iceland gave us memorable tastes of "life up north" and of some of the earth's oldest and newest geology. It was a satisfying, full riding season but one that is savored rather than shouted about. Our new bikes served us well and we still delight in the new additions of partial suspension and disc brakes. Flat tires still haunt us, as Bill just sustained another one, I think the 9th for the year which is a terrible record for us. Though we overall had much worse weather this year than any other, we were actually warmer at night that previous years. Being in more affluent countries more of the time yielded us more heating in our rooms at night which was very welcome. And it was the most expensive of our 4 touring years with an unfortunate coincidence of the tanking of the US dollar and our itinerary which had us in relatively more expensive countries more of the year ($1.33/1€ now vs $.85/1€ 4 years ago). We will be leaving Seville in the morning under gray skies and expect to be in Cadiz on Monday, December 6. After a couple of nights in Cadiz, we'll head for British held Gibraltar where we can spend our left over British pounds currency. Our plans after that are a bit up in the air as navigating around the competition for lodging during the upcoming Christmas holiday presents some challenges that we've yet decided how to handle. In a little over a month we'll fly to Brussels and then on to Portland on January 18 for a 2 month stay.